Florida Dog Tracks. Is Their Race Coming to an End? It’s been said that once you know, you can’t un-know. 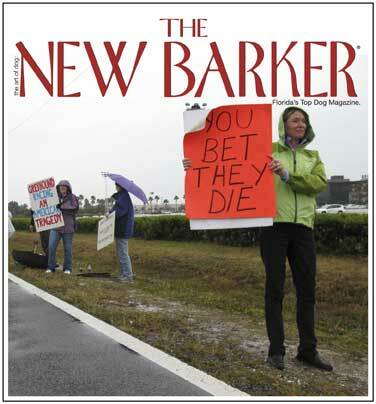 In 2010, while researching the Greyhound dog racing industry in Florida for a piece that would appear in the spring 2010 issue of The New Barker, we were overwhelmed by what we didn’t know. Our biggest discovery, back then, was finding out that dog tracks were closing all around the country. It appeared that as a society, we had became complacent about dog tracks. They have been in communities since the 1920’s. Our grandparents and parents have been supporting this industry by going to the track and betting on the races. We’ve been told through the years that these beautiful Greyhounds are at their prime getting to run as they love to do. We see exit signs directing us to the track, newspaper ads and TV commercials that extol the grace and speed of this magnificent dog. It just seemed like something that has always been. 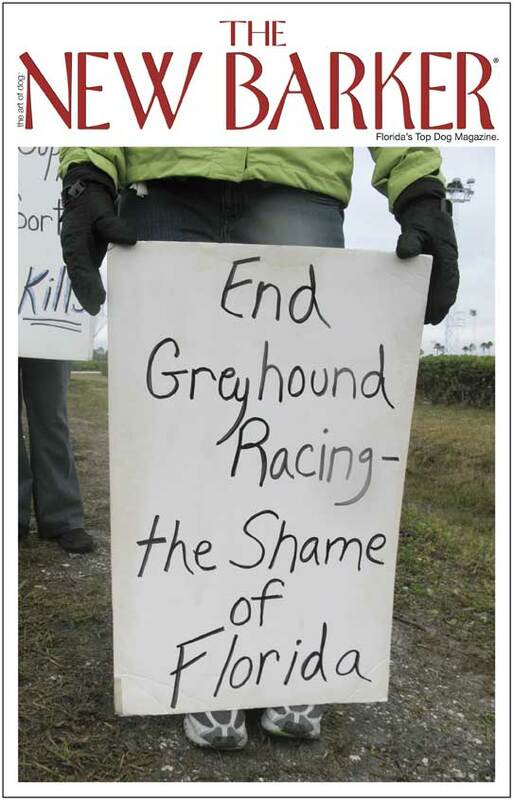 Protesting Greyhound Racing at a Florida Track. But sometimes, if you stop and look at something familiar, you find that what you accept as common just doesn’t make sense anymore. Fortunately for this ancient breed there have been people who stopped and looked at dog racing for what it really is and have refused to accept it. Because of advocacy, education and economics, dog racing is losing it’s following and tracks are closing around the country. At the height of the dog racing industry in the early 1990’s, there were 54 tracks in the U.S. As of January 2010, Florida had the largest number of active tracks housing 13 of the 24 still operating. Today, Florida is one of only seven states where pari-mutuel dog racing remains legal and operational. Of course, dog racing is nothing more than a business and with business comes the bottom line and matter-of-fact decisions. Normally those aren’t bad business qualities. What makes this problematic is that this industry’s sole commodity is a living, breathing, feeling being that has no choice of opting out. The business is cyclic. Produce, exploit, dispose, repeat. The industry has very little oversight and plenty of ways to work around the system. The reality of this cycle is that it involves the production of sentient beings and the ultimate disposal of same. In addition to racing and the operation of kennels and tracks, there are several things that exist behind the scenes to keep this business profitable. To get winners, the industry must breed the winners. The puppies are raised, trained, and screened to determine if they are racers or eligible for other uses, if not, they are killed before being registered. If a dog is a racing dog, it’s career may last between two to five years. Their performance determines which track they go to first. If they are good racers, they go to good tracks. As their performance declines, they are moved to smaller, less profitable tracks. This shifting of locations happens continually until their racing days are over. In the eyes of the business, this commodity is only profitable if it is racing at good tracks and winning. If that’s not the case, the cycle determines that the dog needs to move on to make room for one that will perform. It would be nice to think that all retired racers go to rescue groups and find their forever homes, but that percentage is small compared to the number of dogs that leave the track. There are other qualities of the breed that determine their next placement. After racing, a dog can be sent to a breeding farm to produce multiple litters for three to four years. It takes 600 to 1,000 racing dogs to support one track. Those are just racing dogs. Many thousands of dogs must be produced to supply tracks with 1,000 good racers. The atrocities of puppy mills have come to the forefront over the last few years, thanks in large part to people like Oprah Winfrey and Ellen DeGeneres. Yet, according to industry breeding reports, published in The Greyhound Review, 77,852 litters were registered by the National Greyhound Association in the twelve-year period between 1989 and 2000. Multiplying these litters by a [low] average of 6.52 pups per litter results in a minimum total of 507,596 greyhounds born in this twelve-year period. Greyhounds are tattooed by three months of age and individually registered by 18 months. Listen to Christine Dorchak, President of Grey2K USA talk to The New Barker on The SkipShow, about a hopeful change coming to Florida Greyhound Racing. Show airs January 9 between 3p & 4p EST. http://www.tantalk1340.com. We, as a society are becoming more educated about the number of dogs euthanized each year in shelters across the country, thanks in large part to Nathan Winograd and the No Kill Movement. As a result, we are demanding a change, and the No Kill Movement is moving forward. And yet, of the 507,596 Greyhounds born in the aforementioned twelve-year period, only 395,545 were individually registered — a discrepancy of 112,051 [22%] puppies and young dogs that were culled [killed] from the system before the age of 18 months. Because rescue of young farm dogs is extremely rare these culls are presumed dead. A comparison of the published numbers against the estimated combined number of dogs that are still racing (40,000), alive on breeding or training farms (30,000), and dogs that have been adopted (113,000), indicates that close to 325,000 greyhounds, including the culled puppies, have died between 1989 and 2000. That is approximately 27,000 dogs per year for that twelve year period. The fact is, the racing dogs are owned by a business. The owner of the dog decides what’s next for each dog at every stage of their lives. Have no doubt that the decisions made are best for the business, not the dog. Because of Greyhound advocates like Grey2k USA, Greyhound racing is coming to an end, and a much larger number of dogs are finding homes through rescue groups. However, as long as dog racing exists, thousands of greyhounds will be thoughtlessly and inhumanely exploited and killed every year. Now you know. The New Barker is Florida’s top dog lifestyle magazine, reaching more than 40,000 dog lovers each quarter in print. In its sixth year of publishing, every cover of The New Barker features an original piece of art by a different Florida artist. Excellent piece calling attention to the atrocities of dog racing and the shame related to an industry that has exploited this wonderful breed for so many years. I hope Floridians become more aware of the need to shut down this disgraceful industry in their state. So impressed that The New Barker Magazine is willing to talk about the tough stories. Raising awareness and educating the public is a service and one that is done well by this editor and magazine. Previous Previous post: A New Year’s Resolution: Help Feed the Dogs of Those Who Cannot. Next Next post: Redemption for Shelter Animals in Hillsborough County, Florida.